Virtualization and the cloud are now mandates for IT. Consider the data: In an AMD study 37% of organizations worldwide reported they are currently operating in the cloud. The five-year outlook for cloud shows an annual growth rate of 26%, which is five times greater than the rate of traditional on-premise IT offerings. 92% of AMD's cloud customers stated that the infrastructure was an important part of the decision to implement cloud computing.If you manage IT, you are going to be dealing with virtualization and cloud computing, if you are not already. (OEMs) as HP and Dell. The nuanced choreography between AMD and its technology partners results in virtualized environ-ments that optimize performance, power and cost in a variety of task-specific scenarios. Industry adoption has been strong, with nearly 2 million AMD processors engaged in cloud computing clusters worldwide. 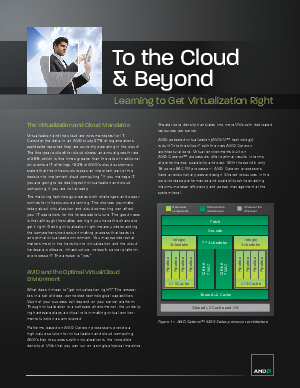 Download this whitepaper to learn more about getting virtualization right.